Last week I was lucky to but a very special and detailed map from a internetshop in Thessaloniki, “Chartis Agiou Oros – Chersonisou Atho” (Map of the Holy Mountain – Peninsula Athos). The map is made a Greek architect, mr. E. Papasotiriou. This is first time it is shown (in 5 pieces) in detail on the internet, although you’ll find it here (with many other maps). Map 1 – the border, Arapis, Nea Roda and Ouranopolis. The map is originally published by the Ministery of Foreign Affairs. The map resembles the Zwerger map, but on this one more contour lines are shown. Zwerger gives you on the other hand more information about the altitudes, which is missing here. Map 2- Chromitsa, Megas Zygos and Chilandariou. It is difficult to date the map, although I estimate that is made in the 60 or 70-ties of the last century. The main reason for this assumption is that the dirt-road to Lavra is missing on this Greek map. When I walked to Lavra in 1980 this road to Lavra was already finished and the Zwerger-map from 1980 also shows this road. map 3- Chilandariou, Sografou, Docheiariou, Xenofontos, Esfigmenou and Vatopediou. In the legend (Ypobima) the different type of roads and paths are explained. Maybe old paths will appear on this map and can be “re-discovered”, I did not have the time to find it out! Notice the locations named “Archaia Ereima”, printed in red on this map. It should be old (classical Greek?) ruins? Other signs from the legend are wells, springs and reservoirs. Near Jovanitsa you can see the name Megali Moni. What could this have been? Zwerger doesn’t mention this place on his map. Could it have been on old forgotten monastery or just a big house? 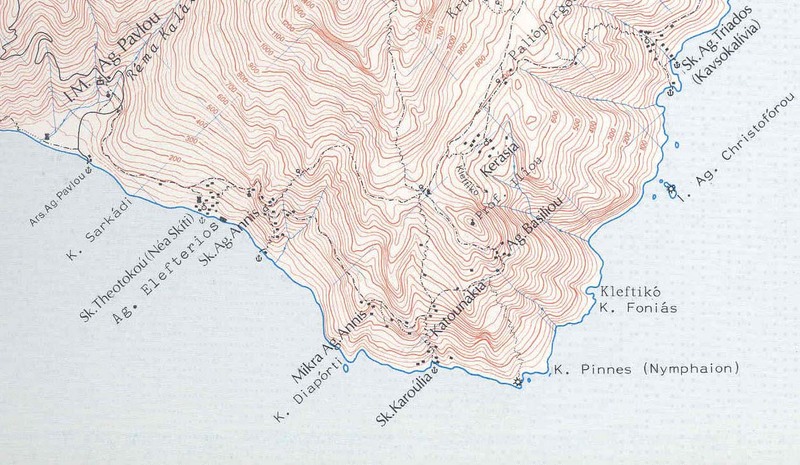 Map 4 – the middle section of Athos, with Karyes (its name is not mentioned!) and many other monasteries. The road from Dafni to Karyes is drawn, so the map is absolutely later than 1963, when this road was build. Notice that the settlements Mylopotomas and Bogoroditsa are missing on this map. 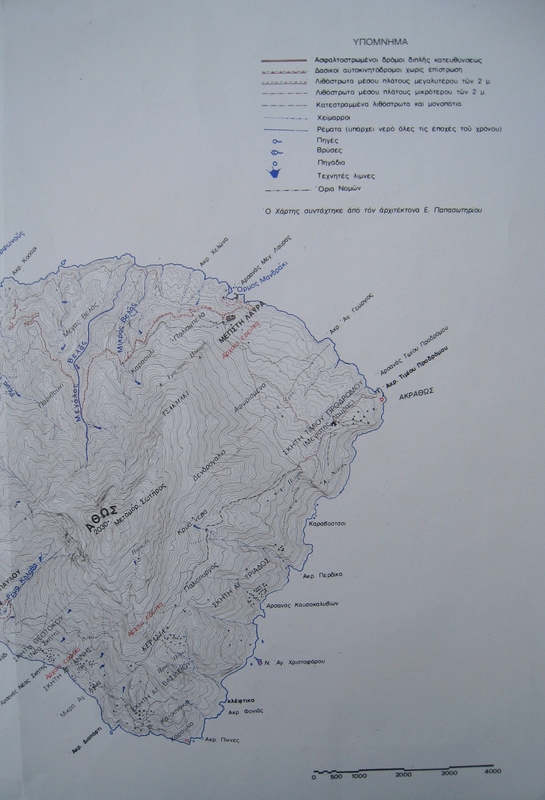 Map 5 – the mountian itself, Skiti Anni, Prodromou, Lavra and the legend. 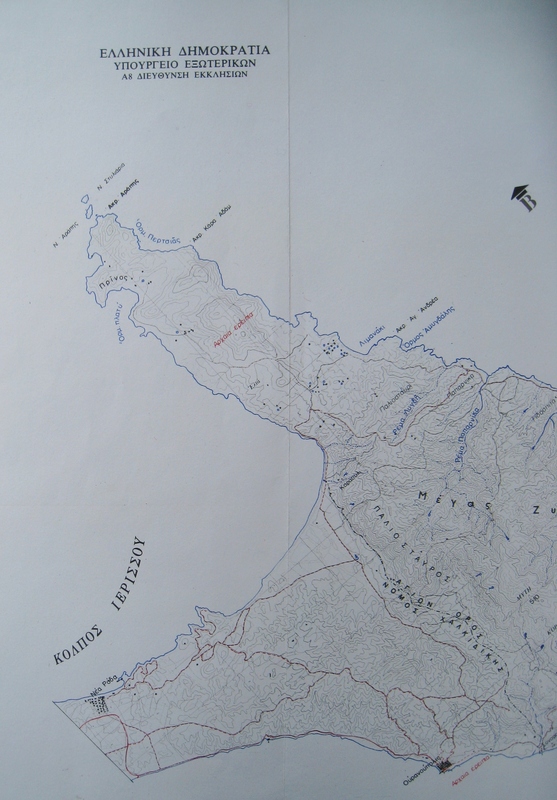 The interesting question is if Zwerger was in the possession of this map, before he made his first in 1980. If you look at the special names of all the different torrents and ravines, I think Zwerger must have used this map to create his. Almost every name of a monastery, skiti, settlement the and the names of geographical places, that are found on this Greek map, are published on Zwergers map. Zwerger’s map is actually much better to use, because the graphic design is of higher quality (less detailed contours, better colors), and the map is more up to date. Anyway, it was a pleasure to show you this old map. I myself have used one of his first rough copies in 1980. In his book he writes that a first useable map was ready about 1974 for his friends. And from one of them I got a copy in 1980. 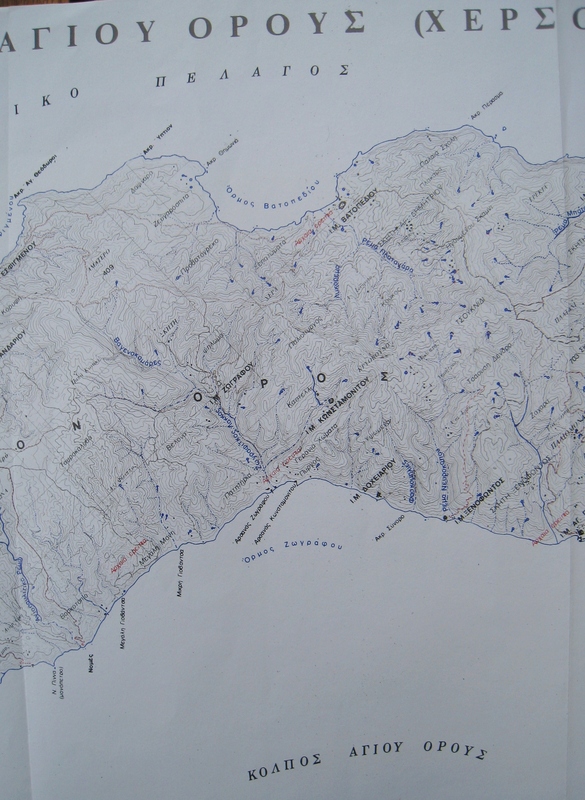 He also noticed that he used an greek army map from 1960 he got from the abbot of Chilandariou. In this army map the topo was quite okay ( 100 m alt. lines) but most of the roads and paths were not correct. This specific map is heavily based on the official military map which has last been updated at the 80’s. I would like to know if it is somewhere available for purchase btw. The original military map, not of much use now I’m afraid due to the new roads opened, but still interesting as this was the only accurate and scientific map for many decades, is available in two sheets through the website of the hellenic military geographical service (HMGS, gys.gr). It is also the default map that you would want to have a look at, in order to find the official name of any landmark (capes, peaks, settlements, rivers etc.) in presence in Greece. Back at the time it was really-really difficult to be able to obtain this map due to bureaucracy involved and the permissions that had to be obtained. Nowadays it is just a matter of a few clicks at the gys website but more interesting is the fact that one can have a preview and browse around this map just by entering the geoindex of gys’s e-store, and selecting “Auxilliary background Map” at the maps page on the left -preferably deselecting all other products for a more clear view-, after zooming in at mount Athos and clicking refresh. 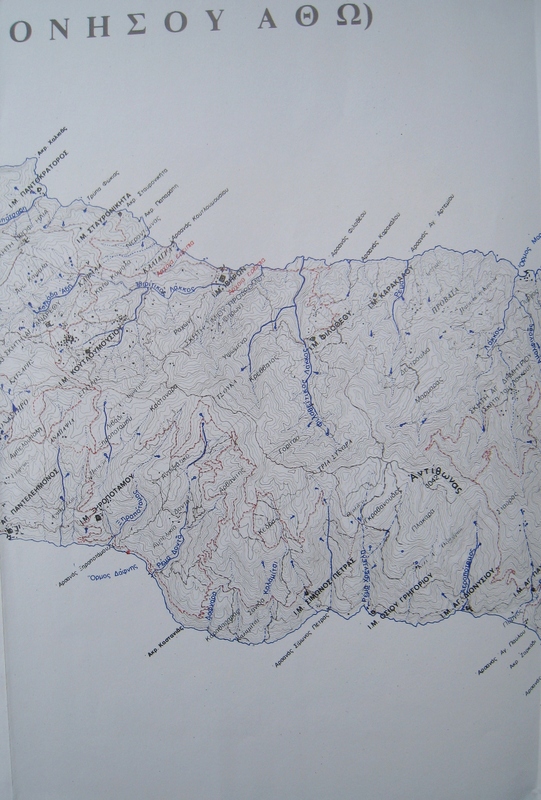 In it, he says that he used a sketch-map published by Tsiropoulos et al, for the mountaineering club of Thessaloniki. Would anyone has any info on it? The http://web.gys.gr/GeoSearch_EN/ map looks very detailled and complete but I was not able to see the map sharp. If you zoom in the names and roads remain vague. I tried it with Firefox and Chrome but unfortunately no sharp images. 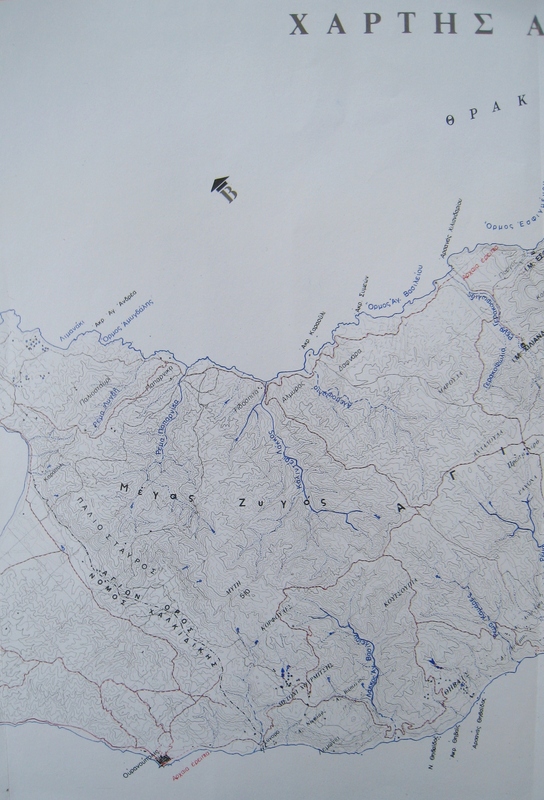 Well, it is a low resolution image as the maps are not free, you can buy from the page either the raster or the digital ones, but still there is plenty of detail available. Consider it more like a preview of the real map.